Nollywood is having a sad face, as two actors have bowed out of the industry. Actor Charles Warren died on Thursday night in a hospital in Lagos, after brief illness. He was said to have complained of severe chest pains, and was rushed to the hospital where he died. Charles Warren played sub-lead roles in numerous movies such as, State of Emergency, Law 58 and many others. 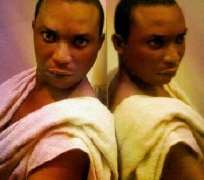 Segun Arinze,iffy okeke and Kabat Esosa display his pictures on their BBm as tributes to him.